Dungeon-lighting photos in today's post (thanks, winter). It sounds like we're entering the cold snap at last, friends-who-live-in-the-Northern-hemisphere. Last night my kids were waiting with bated breath for the phone call to say the district was closing the schools because of the wind chill. Didn't happen. Frigid as today is, it didn't make the negative-35 windchill quota. Apparently we're made of sterner stuff in MN than most. So with the children all bundled up onto the school buses and off to lessons, I'm home alone today, trying to decide between laundry, filing tax returns or blogging. By the by, I hope you guys aren't bored with all the recent cat posts. They won't go on forever, I promise. 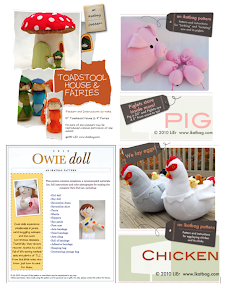 I like to think of them really as cardboard posts, with some cat cameos, in the same way that so many of my other posts are sewing posts in which my children model clothes as supporting actors. 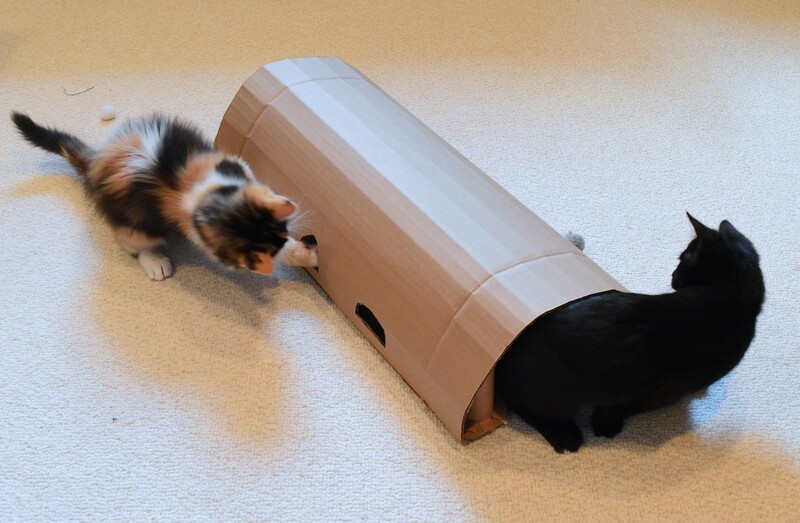 Today's post is about an almost-fail cat tunnel. 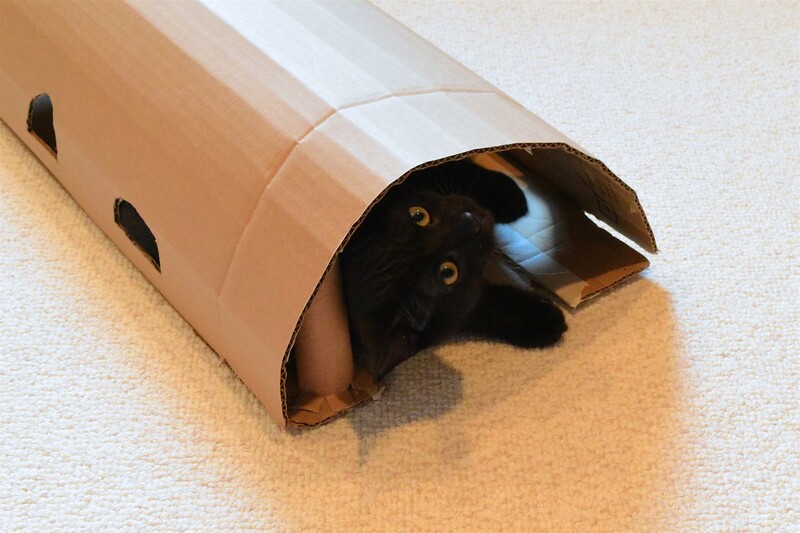 I made it while cleaning my sewing room out of all the cardboard leftovers from another project (not cat-related, and about which I will blog soon) and watched the cats dart in and out of random boxes. I remembered reading somewhere online that cats liked poking their paws into holes to get stuff, but that holes were dangerous if they were large enough to tempt them to also poke their heads into. 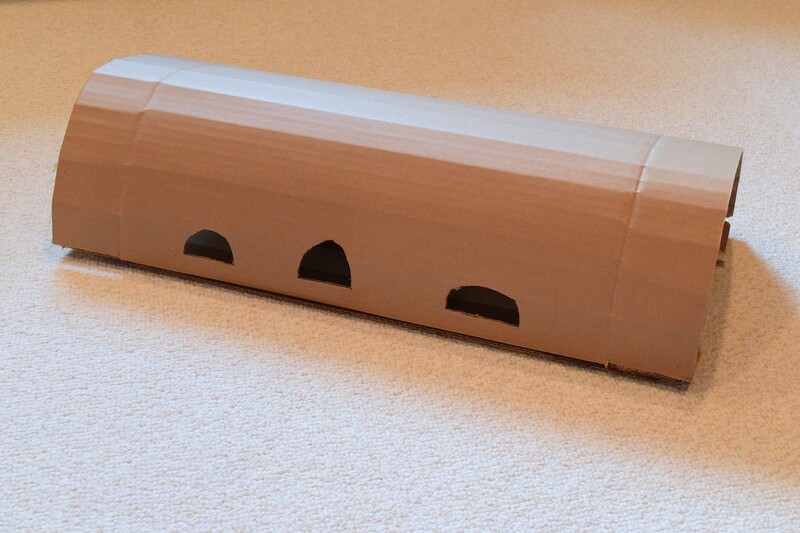 So I wondered if I could make them a box with politically-correct-sized holes in the walls to play poke-a-paw with. Then I remembered that unlike the claustrophobic humans who raise them, cats adore fewer things more than hiding under sofas, in the dishwasher and other stupid-tiny spaces. 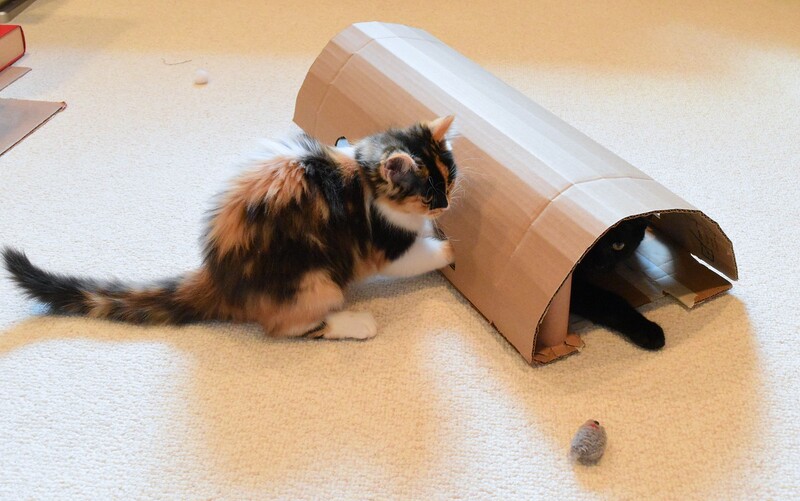 So I made them a tunnel instead. It's quite daft, as you can see. It's literally a large piece of cardboard that curves over and is glued to a flat base. I cut out six windows - three on each side. 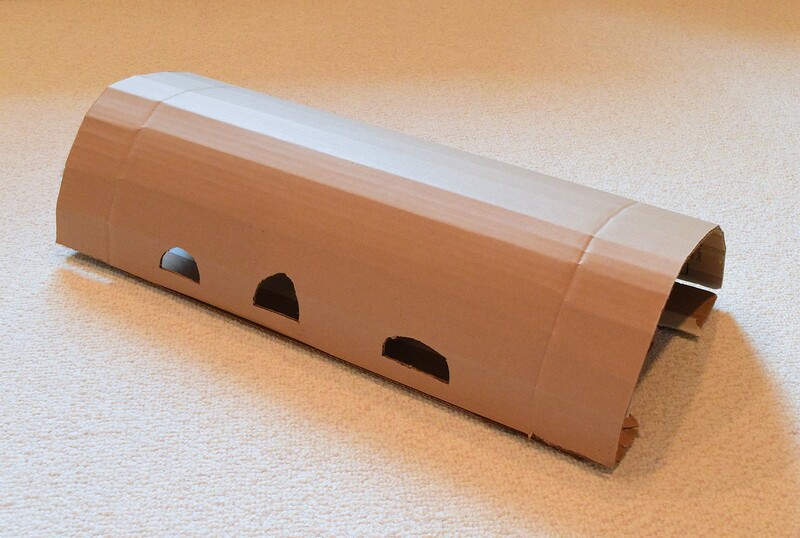 If this had been superior cardboard, the physics of convex curves would dictate that the roof be strong enough to hold its shape as is under jumping cats and the accidentally-misplaced human foot. This cardboard remnant, however, was a bit saggy, so I added a supporting post at each of the two entrances. You can see it to the left of Milo's head in this next photo, as well as in the other photos following. 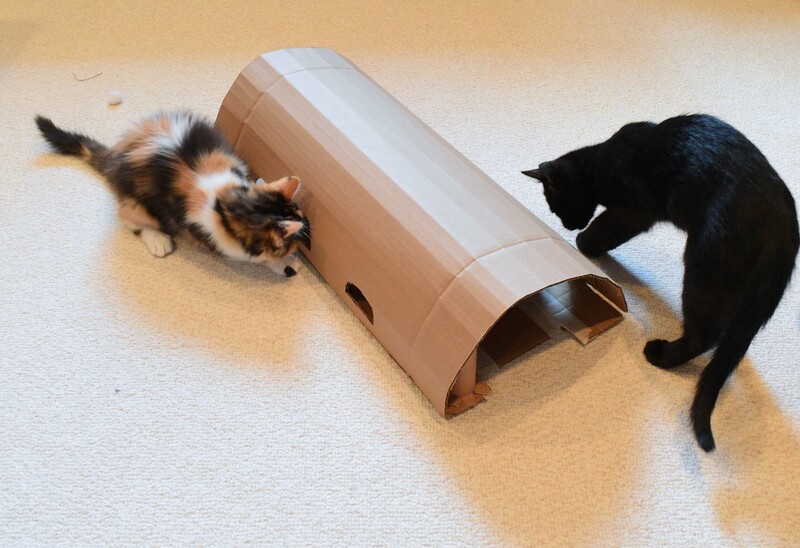 I initially wanted to title this post Cardboard Tunnel Fail because after I'd made it and triumphantly presented it to the cats, they completely ignored it. Sniffed it with polite interest, yes, then turned their backs on it and went off to roughhouse inside a random storage basket. Later that day, however, the husband reported that the cats were playing with it after all. 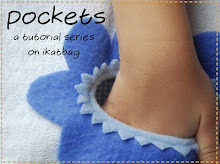 I was surprised but somewhat suspicious - how many times have my own children done something similar with clothes I've made them? You know the ones they wear just once because they're new and fun, and then never again? 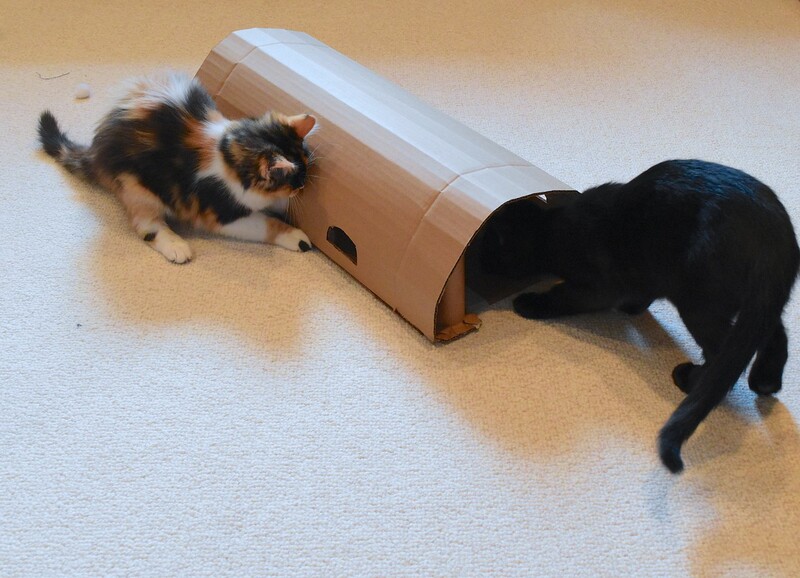 Interestingly, it's been almost a week and the cats are still playing with the tunnel. Well, then. So I took some sequence-shots (which, if we squint just so, we can pretend are a still-frame video of sorts). And here is a solo shot of Milo's paw trying to get at stuff (mouse? pompom? Heaven only knows) through one of the windows. 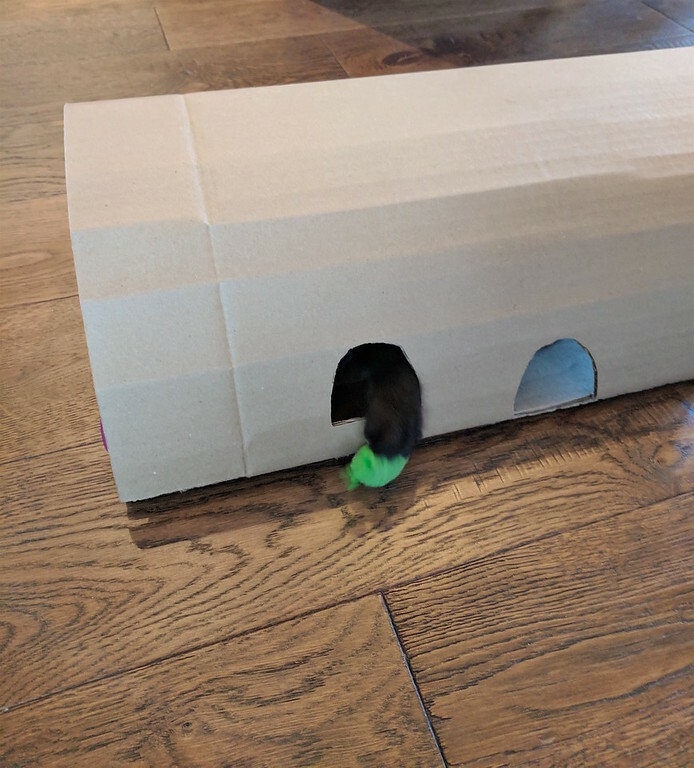 The upside of cardboard cat toys - apart from the actual cardboardness - is being able to recycle them once the cats have lost interest in or totally wrecked them. I know I'll feel sad dismantling everything and tossing it into the bin, but it won't feel like money down the drain because they cost practically nothing to make. The downside, however, is using up actual cardboard to make them - cardboard I was secretly scheming to save and turn into an avant-garde scratching recliner furniture thing. Which I can't now, obviously, because I don't have any cardboard left. This is the sad reality of opportunity cost. Or a sign that I might need to start hoarding cardboard again. P.S. Stay warm and safe, friends. Next week it's supposed to dip so low that school might actually be canceled for real. Haha, you inspire me to do more than throw random cartons and boxes on the floor and let my cats have at it. 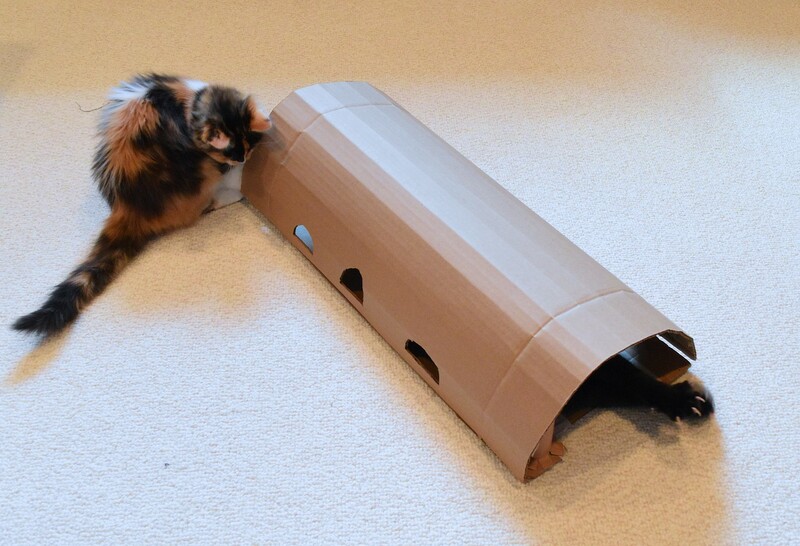 They do like jumping into the boxes, having a mini-tussle with some phantom enemy or their own tail, and then jumping out and into another box, but some more creative approaches to constructing an actual thing may stimulate them a bit more. Unlike you, I have cardboard stored in the garage! I also hoard cardboard trays from mail order cat food. I guard them ferociously from my kids, as they make perfect trays to separate the myriad of sewing projects heaped on my cutting table. What a delightful toy. I am sending this on to my sister for her cats!